I went shopping yesterday. Ugh! The day after Thanksgiving is now commonly known as Black Friday. It's a day that retailers rely on shoppers to go out and spend money like crazy. There are some good deals, but they hope that you will spend on more than just the deals. The last few times that we've been in Seattle for Thanksgiving, we have gotten up at the early morning hours to go to the mall and laugh at the shoppers who are fighting over a $500 flat-screen TV. We don't usually have the intention of buying anything our selves, but we sometimes get tempted. Of course, by the time you get to the line to the check-out THAT WRAPS AROUND THE WHOLE STORE, you suddenly decide that you don't need whatever it is that you are tempted to buy. This year, we had resolution that we were not doing it. However, we did go out later in the morning to get some stuff. We missed the initial crush of crowds, but the places were still pretty busy. We got the stuff that we needed, and I don't think we need to go shopping again. My problem is that I don't like Black Friday. I don't like buying crap for Christmas, just because it's on sale. I don't want to get someone something they don't really want, but that I wanted to get them. I think that there is massive pressure to buy just to buy. Christmas has gotten out of control. We don't need to celebrate the birth of Jesus by propping up a culture of consumption. I was hoping that the recession would have taught us to act differently. I have yet to see evidence that it has. There is a good book out this year called Scroogenomics: Why You Shouldn't Buy Presents for the Holidays by Joel Waldfogel. It presents a good case of why we shouldn't be spending our money like crazy. Maybe I should put that book on my Christmas list! It's the year of the flu. Panic! Virus! Except, it was only a few years ago that we panicked about the flu. Do you remember when we had a vaccine shortage? That seemed to cause widespread consternation. And then we had the avian flu before then. But this is the year of H1N1 (the flu formerly known as "swine flu"). With vaccine shortages (of H1N1, not the regular flu), there seems to be talk of "epidemic" or "pandemic". What will happen? I have had some friends who got sick, but I've mostly been kept away from it. I think there are a few reasons for this. 1. I no longer work on a college campus. I work in an office where we are sufficiently spread out and generally don't touch the same stuff a lot. 2. I'm a big hand-washer. I make sure that I scrub for 20 seconds before rinsing. 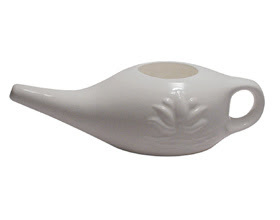 Yes, the neti pot is the reason that I wanted to write this post. I've heard about it for a long time. Last winter, one of my co-workers said how much he liked it. Now, I'm doing it for myself. What's a neti pot, you ask? Well, it looks like a tea kettle. You put some salt-type solution in it and fill it with warm water. The water needs to be about the same temperature as your body. Actually, when I'm making tea, I put boiling water in it and then go and do other things for about 30 minutes. Then...here comes the fun part...then you lean over the sink and put the spout in one of your nostrils. You then slowly pour the water into your nostril and feel it run up, into your head, and around your sinuses (it's a freaky feeling). Then, the water comes running out your OTHER nostril and into the sink. It should be carrying with it all that mucus that is up in your sinuses and draining them out slowly. It's like blowing your nose, only more effectively. The mucus is broken up and runs out. I have to say, I can feel it working. Before I did this, I could often feel full sinuses, just sitting behind my face. Now I feel them in the morning, but after doing this system, I feel much better. I also haven't gotten sick yet. I don't know if I can completely attribute that to the neti pot, but it's probably helpful along with the other things that I'm doing. Of course, the neti pot is pretty gross, if you think about it. I have friend who call it the "snotty pot". But it can't be more gross than blowing snot onto a hanky, right? It has been increasingly apparent that I am going to need to learn to ask people for money. This has been true for a while. I have done some fund raising for The Naming Project. Of course, for that, we only needed enough to make the camp run. Now, with my new job, I'm going to be more and more responsible for money. I need to know how to budget. I need to know how to get the money, and that means that I need to be able to ask people to give the money. Here's the problem, I hate asking for money. I see that it is a necessity, but I really don't want to call someone up, or visit with them, just to get their wallets open. I know, I know. I've been told that if you development right, you are not being smarmy. You are giving people an opportunity to support a ministry that they believe in. People believe in both The Naming Project and Lutherans Concerned/North America. I just don't want to be the one to ask them for it. And I've been able to avoid it at LC/NA, until recently, when it became apparent that I was going to have to do something. I was given the name of a donor who has been a good supporter in the past. This was a very "safe" call. So, I put it off until nearly the end of the day. Then I finally dialed. He picked up...and I started talking...and talking...and rambling on. I wasn't even making much sense. I was ending my sentences with things like, "...and that sort of stuff." I mean, that's what you say when you have NOTHING TO SAY!!!! I wasn't letting him say anything. I wasn't listening, I was just trying to "set the stage", but doing a crappy job of it. All the time I'm talking, I realize how bad I sound. I have an internal dialog that says, "Shut up and get on with it. He knows what you are calling for, just do it." So finally I abruptly jump into asking for money. An additional contribution to help us with current expenses. He told me that he couldn't promise anything until he talked to his wife, which was understandable. I thanked him and got off the phone pretty quickly. I realized that my heart was pounding and that I was sweating...from having a conversation on the phone. This is how bad I am at this. Here's the blessing. This is someone who knows me. His family has supported us, sometimes unsolicited. He probably knew that I was new and uncomfortable with asking for money, but he patiently listened while I rambled. He knew that he was my "training ask". He told me what he needed to do (talk to his wife). I thanked him and hung up quickly. Yesterday, I got an email that let me know that they were mailing a check. I wrote back, thanking them both for the donation and for his patience with my rambling call. People in my office are congratulating me for my successful call, but I think these people are more generous than I am successful. Eventually, I hope that I get better, and more comfortable, with this. It will take time and practice. So, if I come to your door to ask for money, you can help my learning curve...and help my organization! Because someone else said it better than I could, I give you the words of my colleague, Justin Lee. So, here I am on another election night, hitting "refresh" on my computer over and over again. Why? There isn't a presidential election, there are no state elections in Minnesota, and I'm not too concerned about the Minneapolis mayoral election. So what is compelling me to constantly search for voting results? I'm not sure, but I think that it has to do with leftover energy from a year ago. One year ago, I felt like I was watching the world change from one that was very scary to one where I saw possibility and hope. I was thrilled at Obama's election. I was frustrated that Al Franken wouldn't be seated for another 9 months. I was bitterly disappointed in the Prop 8 vote in California. I think that I've carried all those emotions with me for a year now. I still feel a thrill, frustration, and disappointment. Not only in the political world, but in my vocational and personal world as well. As in everything, life is a mixed bag. I get the sunshine and the rain. I'm particularly interested in the referendum in Maine. This is possibly the first time that voters will uphold a law allowing for same-gender marriage. I had high hopes for California, but it didn't happen. As I write this, there is still a slight lead for voting down the referendum that would take away the benefit of marriage. I'm more hopeful now. I'm following a similar referendum in Washington state. It's too early to get any results now, so I probably won't learn more until morning. This is not marriage, but it is pretty close. It provides the legal protections and benefits that come with marriage. It means that when we visit my partner's family, I might be able to react and respond if something REALLY bad happens. Many news programs have been calling this election an evaluation of Obama. I guess I don't see it that way. Yes, there are a handful of congress elections, and a couple governor elections. However, this is about keeping politics local. And sometimes it's good to focus on the local politics. By the way, I sure hope that R.T. Rybak wins, because the rest of his challengers looked completely crazy when I tried to research them. There is one guy who is on the ballot who believes that Laura Ingels Wilder is god. Another is a part of the "Is Awesome" party (Joey Lombard is awesome...get it?). At least I voted. I feel like a good citizen.